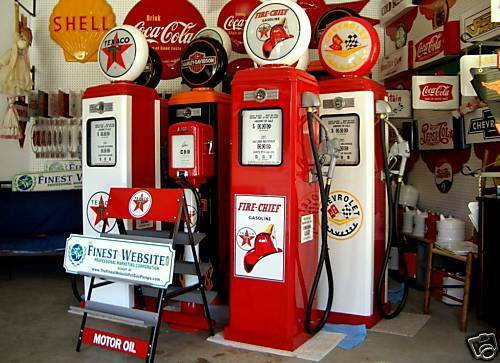 "FINISHED IN HIGH GLOSS DURABLE PPG AUTOMOTIVE PAINT AND VINTAGE LOGO THE STYLISH CLEAN LINES OF YOUR NEW FULL SIZE REPRODUCTION GAS PUMP WILL MAKE A GREAT ADDITION TO YOUR GAMEROOM, RESTAURANT, DINER, BAR, LOUNGE, GARAGE, AUTO PARTS STORE, AUTOMOBILE SHOWROOM, GAS STATION, ANTIQUE STORE, ETC. 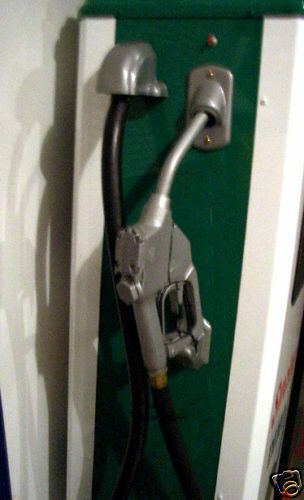 YOUR OLD CLASSIC REPLICA GAS PUMP INCLUDES RUBBER HOSE, NOZZLE, VINTAGE LOGO, A GLASS WINDOW SEALED BY A RUBBER GASKET, AND A MATCHING GLOBE ON TOP THAT LIGHTS UP WHEN PLUGGED INTO STANDARD 110 OUTLET. 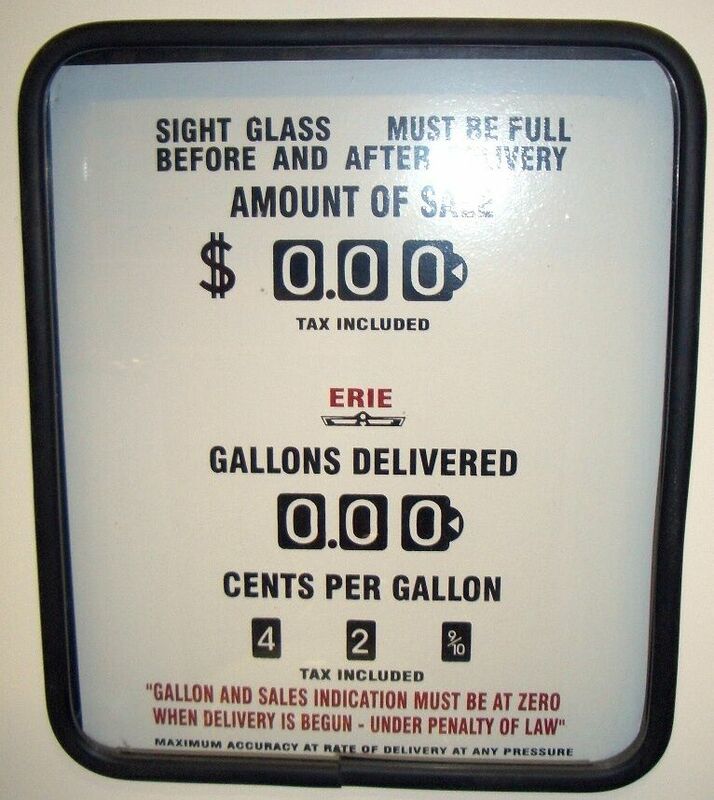 ALTHOUGH THIS 1950s ERIE STYLE FULL SIZE AUTHENTIC REPRODUCTION GAS PUMP LOOKS ORIGINAL, IT WILL NOT PUMP GAS AND IS FOR DISPLAY ONLY. THIS IS A TWO SIDED GAS PUMP WITH LOGOS ON THE FRONT AND THE BACK. ADVERTISING OIL AND GAS STATIONS FROM THE NOSTALGIC PAST. SHIPPING : FREE SHIPPING IN CONTINENTAL U.S. ALLOW 2-3 WEEKS FOR DELIVERY AFTER PURCHASE. GAS PUMPS ARE FRESHLY PAINTED WHEN PURCHASED AND NEED A COUPLE DAYS TO DRY. SHIPPER IS UNITED PARCEL SERVICE ( UPS ). SHIPPED IN 2 OVERSIZED BOXES. ASSEMBLY REQUIRED. ASSEMBLY : YOUR STYLISH CLASSIC GAS PUMP IS SHIPPED IN 2 BOXES AND REQUIRES ASSEMBLY. EVERYONE IS DIFFERENT, BUT ASSEMBLY TIME IS USUALLY 2 1/2 HOURS. ASSEMBLY INSTRUCTIONS INCLUDED. PAYMENT : PRICES ARE IN U.S. DOLLARS. THERE IS NO SALES TAX OUTSIDE OF NORTH CAROLINA. NC RESIDENTS MUST ADD 7% SALES TAX. DIMENSIONS : 78 INCHES HIGH, 16 1/2 INCHES WIDE, 16 1/2 INCHES DEEP"
Email thefinestwebsiteforgaspumps@charter.net with any questions about this or any of our other products.